The site was created to promote Tampa’s National Historic Landmark District’s growing assets, complemented by a catalog of stunning photographs taken by local photographer Gabriel Burgos. Key features of the new website include a cleaner and more attractive design in a responsive architecture promoting usability across all devices; simple “one click” hyperlinks to offer a more engaging user experience; enhanced search and navigation functionality; and, the capability to experience all that Ybor City has to offer residents and visitors alike. Promotional areas throughout the website feature more ways to explore, live, do business and get around Ybor City. The elegant yet simplistic photo grid design of the site provides an eye-catching and welcoming feeling. The site was crafted to boost the discoverability of the historic district, drive new businesses, and—ultimately—grow the neighborhood. “We pushed our team hard to get the new website designed, built and tested in order to launch by December 1, 2016, so that we were ready for the busy holiday season and the upcoming surge in visitors expected with the incoming 2017 College Football Playoff National Championship and the Outback Bowl. We did it!” Orr said. Ybor City Development Corp serves as the community’s liaison for economic development, City of Tampa municipal services and special events, residential and commercial real estate inventories and coordinates infrastructure improvements, and manages the District’s Clean Team (YES Team) and Ambassador Program. Ybor City is a historic district in the city of Tampa. Several structures in the historic district are listed in the National Register of Historic Places. Evoking the history of Ybor City, the classic brick streets and historic facades blend into a distinct sense of culture that enlivens your environment while preserving a rich history of diversity, community and industry. 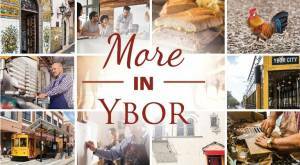 Professional office and services, retail stores, lodging, dining and entertainment, technology, manufacturing/construction/Industrial services are just a few of the industries thriving in Ybor City.